Sabah PAS supports Chief Justice of Sabah and Sarawak Richard Malanjum’s suggestion that the authorities, especially the Immigration and National Registration Departments, run a check on the documents held by every Pakistani in Sabah. I also personally agree with the Chief Justice’s comment which appeared in today’s local newspaper that there are so many Pakistanis in the state and we do not know whether their documents are genuine or otherwise. Just go to groceries stores at villages near Kota Kinabalu. Even better, take a walk at the buildings around Segama, Sinsuran, and Wisma Merdeka. You can see them there everywhere. I think the Chief Justice’s suggestion must be taken seriously by the Sabah government and the authorities if they really want to solve the issue of illegal immigrants. As of now, I don’t see any serious efforts coming from the federal and state governments on this matter, except the establishment of the Royal Commission of Inquiry (RCI) Working Committee on Illegal Immigrants. Even this committee, based on its chairperson’s recent statement during the Tawau Parliamentary Chinese New Year celebration, has not done anything active and positive. In the statement, the working committee chairperson Joseph Pairin Kitingan said its goals were to collect all the information and suggestions in order to solve the problems of illegal immigrants in Sabah. He added that the committee will accept proposals from individuals and non-governmental organisations. Why must the committee still collect information and suggestions to resolve the problem when the recent report of the RCI on Immigrants in Sabah has made damning findings about illegal immigrants here? Please refer to the notes of proceedings taken by the RCI during the enquiry and the committee will see lots of evidence and information there. In respect of the solution, please check the findings of RCI. 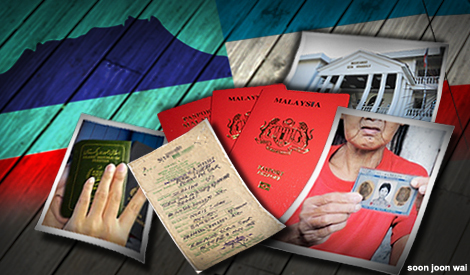 The report specifically mentioned that one of the causes for the presence of illegal immigrants in Sabah is the existence of syndicates and corrupt individuals in issuing identity cards and documents illegally. These syndicates would sometimes operate with the collaboration of corrupt officials of relevant departments such as the National Registration Department, Sabah (see page 261 English version of the report). The working committee should act on this. Perhaps the committee should include the Chief Justice’s suggestion as one of the proposals in solving this issue. But with due respect to the learned Chief Justice, whose decision in enhancing the jail sentence of the offenders last Wednesday I greatly respect, I don’t think the courts should impose a long imprisonment term to illegal immigrants convicted for immigration offence, unless they commit other criminal offences. It is not good to our state budget. Our state government has already incurred a very high cost for the non-citizen prisoner. In the recent RCI report, it was found that the prison department had incurred the following expenditures in the period from 2006 to 2012 : RM281,455,515 (Kota Kinabalu Male Prison); RM45,867,360 (Kota Kinabalu Female Prison); RM112,873,693 (Sandakan Prison); and RM163,884,270 (Tawau Prison). Thus, the total amount of expenditure for non-citizens is RM604,080,840 for a period of about six years. I therefore suggest in future cases, the court would impose a short jail term – perhaps a month – and an order to immediately send them back to their respective countries after completing their jail term. I also repeat here Sabah PAS’s stand that the federal government must amend the relevant criminal acts and categorise the act of giving birth certificate or MyKad illegally, including passport and visit pass, either through syndicate or not, to illegal immigrants as a capital offence punishable with death by hanging. With the new law applicable throughout the nation, Malaysians who are proved to commit the above offence can be convicted and be sentenced to death by the court. This is because their action is an act of treason; they are traitors to this nation.